This Mandalay city tour gives you a chance to see all the best finding what to do in Mandalay city including Mandalay sightseeing tour and beautiful Mandalay hill sunset from top of the Hill. Your tour guide will lead you for the experiences for culture and history during your visit in Mandalay. 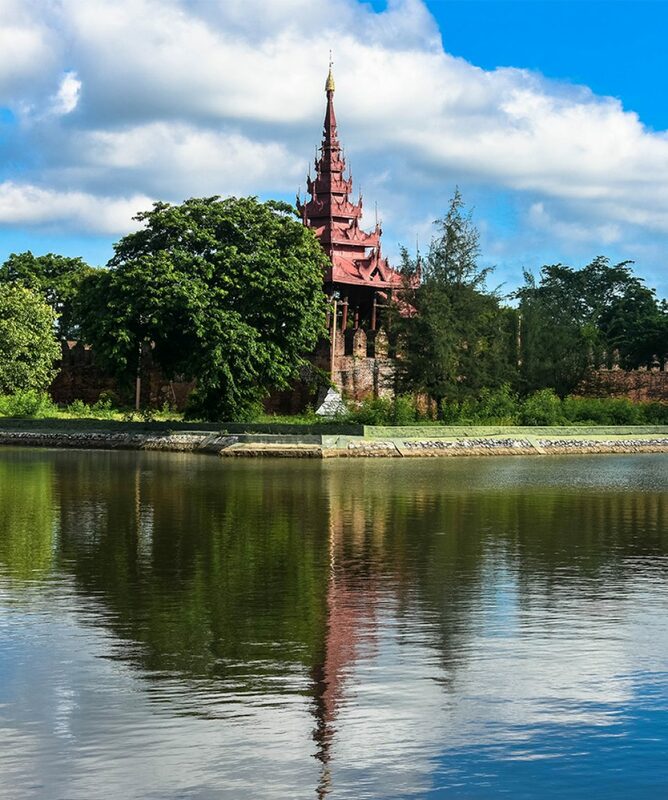 All about the Mandalay Cultural Heritage Tour. We will start our day trip with a visit to the most famous religious site of Mahamuni pagoda. On the passageway of the entrance, you can see many souvenir shops, especially for local Buddhist. Many local Buddhist are coming every day and taking meditation, offering something to Buddha image and so on. So you can learn why Buddhist people come and what they do in Pagoda etc. Visit the area of marble workshops where many kinds of statues like Buddha images, Elephants, lions, Chinese religious icons and even include Indian religious figures crafted daily. Then you will get more experience at gold leaf making factory how the skillful craftsmen are working. Visit Monastery to understand about Monastic education (Regular Primary school at the monastery surround taught by monks and normal teachers) in Myanmar and make a small charity or some interactive activities with the children if it is the school day. After that continue to explore to a local market where you may observe the trade of local community in several products including vegetable. In the afternoon, we will visit Royal Palace, the last palace of King Hsipaw to see the small museum and royal replica. Then proceed to Golden monastery which was the old palace of the King Mindone, father of the last King Hsipaw. Then to Kuthodaw Pagoda famous as ”The World’s Biggest Book” and which was designated as a UNESCO World Heritage Site in 2014. Continue the trip to Mandalay hill for sunset on the top of the hill, and you can have panoramic views over the royal city, Mandalay. Is entrance fees included in the tour price?Can I book this tour in last minute?What do I need to bring with me to do this tour?I am solo traveler and can I book this tour?What do I need to bring for this tour? We say yes, and but it is subject to the availability. We recommend you to book this tour at least 14 hrs in advance to have secure arrangements especially in high season (October to March). We went on an day tour from 8.30 am and returned at 7 pm, with a big authentic lunch included. Our tour guide (Mr. Naing TunTun Win who we hired based on a Tripadvisor review) and driver were competent, very accommodating, and full of history and knowledge. Our time at the Golden Buddha helped us understand the significance of what was going on with pilgrimages around us and architectural images and forms. We strolled thru religious market stalls, purchased some gifts, saw marble making centers for carving thousands of Buddhist images, one at a time, and gold beating as well as the Kings palace and history, and ended the day at sunset on Mandalay Hill. What a day filled with learning, laughter, and fun.Next time I would do a1/2 day at a time to process the rich learning in between. Our guide gave 200% and I would use him again in a heart beat.